College hockey’s March Madness is officially here. This weekend, the National Collegiate Hockey Conference begins their conference playoffs. Entering the NCHC playoffs, the University of North Dakota accomplished something it hadn’t done in the past two months: it swept an opponent. Last weekend, the Fighting Hawks traveled to Oxford, OH, and got an important two-game conference sweep against the Miami RedHawks. With the sweep, UND secured home-ice for the first round of the NCHC playoffs for a 15th consecutive season. That’s the longest current active streak in Division I hockey. The sweep also bumped the Hawks to 12th place in the Pairwise Rankings. If the NCAA playoffs started today, the Hawks would be hosting the West Regional Championship in Fargo, ND. On Friday, UND announced that sophomore All-American forward Brock Boeser was out with an undisclosed injury. Boeser was also a scratch on Saturday night. The bad news didn’t end there. During the first period of Saturday’s game, junior forward Austin Poganski took a puck off of the side of his helmet and left the game. Poganski didn’t return and he is listed as day-to-day. Poganski will be re-evaluated this week. It’s unknown how long Boeser is out. Boeser did practice last Thursday. Before the season began, the Fighting Hawks set team goals. The first goal was to get home ice for the NCHC playoffs. After securing fourth place in the NCHC standings, the Hawks checked off their first box, home ice for the first round of the playoffs. “In August, when we set our goals for our team they’re always the same goals that we want to achieve,” Berry said. “We call it checking the boxes. The very first one is to get home ice. No one in the Fighting Hawks locker room is going to celebrate this series win very long. There’s still a lot of work to be done. To qualify for the NCAA tourney, the Fighting Hawks will need to win their series against the St. Cloud State Huskies. The head coach was pleased with how his team responded this weekend. 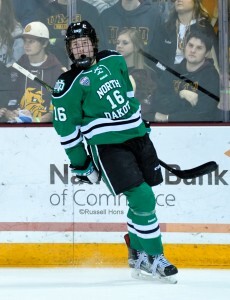 During the offseason, the Winnipeg Jets wanted to sign Fighting Hawks defenseman Tucker Poolman to an entry level contract. Poolman decided to return for his junior season so he could finish his degree and play with his younger brother, a freshman defenseman, Colton Poolman. This past weekend, the elder Poolman did his best Kirby Pucket impersonation. He took the team on his back and led them to victory. On Saturday night, Poolman had a career night scoring two goals, two assists for a four-point night.